Important Note: the GM1 was replaced by the Panasonic Lumix GM5 (compare ). I knew it was smaller than other cameras, I saw the comparisons, but it wasn't until I held it in my hands, when I realized how small it really is. 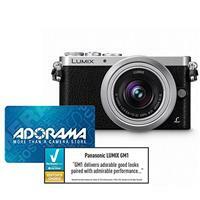 The Panasonic Lumix GM1 is a tiny mirrorless camera. So much so, that the fact that it has no grip makes it difficult to hold steady, especially as you move around with it in your hands. It should have had a grip - it wouldn't have protruded more than the lens does anyhow, so why not? Another size issue of the GM1 is that it's so small that any other lens other than the pancake lenses would be too large - whether it would exceed its height or shift its balance. Having said that, the kit 12-32mm lens that comes with is an excellent fit - makes it feel like a compact camera with a non-detachable lens, except that it doesn't collapse completely into the camera body. Another great option would be the new Leica 15mm lens, which suits its size and is reported to be excellent. Together with the kit 12-32mm - that's what I'd like to have with me on my next travel. Other than that, the body feels solid enough for most casual situations. The flash, springing open like a jack-out-of-the-box, feels like it wouldn't stay in one piece for long. Since the camera and lens feel like they're a match made in heaven, it makes you wish the lens had extracted by itself, like in a compact camera, but no - you need to take off the cap and turn the lens when you turn on the camera. A bit of a hassle if you insist on turning it off and back on all the time. I actually expected Panasonic to create a better synergy between the GM1 and its kit lens. It would have made much more sense if extending and collapsing the lens had turned the camera on and off, instead of having to flip the on/off switch in addition to extracting the lens. Regarding control - it's naturally not as easy to control the camera's parameters as it is with larger cameras, which have many more buttons and dials. However, it is possible to use it in full manual mode without breaking your fingers. Since the Fn1 button is most likely to be set to control ISO, the only quick option to activate wi-fi is by assigning it to a virtual Fn button on the touch screen. I don't like using touch at all, so I ended up deactivating all touch controls and wishing there was a dedicated button for wi-fi, or at least one more Physical Fn button. A small but irritating quirk I found was that after pressing the 'play' button to view the images, rotating the dial zoomed in and out, instead of traversing the images. Not only that clicking the right/left buttons to scroll is slow, it's much less intuitive, so I kept zooming into images every single time. Stealth wise, the GM1 is as non intimidating as it gets. Its unobtrusiveness is achieved by its second curtain mechanical shutter, which is very quiet and still manages to address the rolling shutter effect. Of course, there's also the full electronic shutter, which is 100% silent. There's a caveat to the second curtain mechanical shutter means a 1/50 sec. flash sync speed and a maximum shutter speed of 1/500 sec., but the full electronic shutter allows speeds of up to 1/16000. The sensor at the heart of the GM1 is similar to the one in the mighty GX7. It's therefore came as no surprise at all to find that its images are stunningly beautiful. Having such imaging power in such a small package in nothing short of amazing. This little wonder of a camera is my number one recommendation for people looking for a high-quality compact travelling camera, along with the new Sony RX100 III. High ISO performance showed no surprises. Just like the GX7 and like many other micro four thirds and some APS-C cameras - the crucial point where things start going bad is between ISO 1600 and ISO 3200. On top of that, for on screen viewing - ISO 3200 and 6400 are perfectly usable and all but the highest level can be considered acceptable. It's small and casual and non-binding, it lets you do things you wouldn't normally do with a more 'serious' camera, it makes you try new angles and new lightings, it actually lets you go wild in a way. It's a fashionable camera - not in the sense that it's a soon-to-be-gone trend, but rather that I can certainly see this camera fitting nicely in an expensive purse (or man-bag, if you will). It shares the imaging power of the GX7 (compare ), at a third of its volume, half its weight and three quarters its kit price. There's a trade off, naturally - no full mechanical shutter, just a first curtain one at up to 1/500th sec. (GX7's goes up to 1/8000), no viewfinder and a non articulating lcd screen, poorer battery life and a weaker flash. Its video capabilities are inferior, as well. The choice is clear - choose the GM1 if you want a go-everywhere, no fuss, high image quality compact camera. Choose the GX7 if you want the whole shabang. The matchup with the RX100 III is not as easy to sort out. The RX100 is smaller, has a viewfinder, better video, panorama, an ND filter (though the GM1 has a much higher max shutter speed), longer battery life and NFC. The GM1 has a larger sensor, better image quality and a long list of available lenses to attach to. If you want you camera in your Jeans pocket or for videos - take the RX100 III, otherwise, it's the GM1. Use the Compare Tool to compare the GM1 to other cameras. See where the GM1 is placed on the Feature Graph.